Our proposed topics this week are below. The topics in bold were actually discussed. We also took notes this session, we hope you find this useful. What do you consider to be good culture? 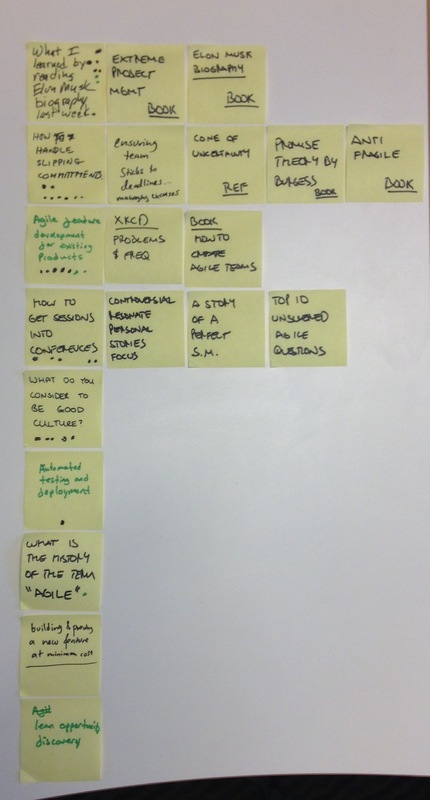 What is the history of the term “agile”? 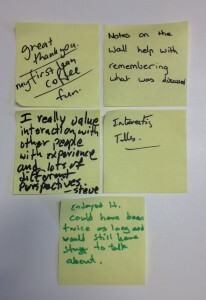 Great, thank you, my first lean coffee, fun. Notes on the wall help with remembering what was discussed. I really value interacting with other people with experience and lots of different perspectives. Enjoyed it. Could have been twice as long and would still have stuff to talk about. Any feedback about the blog is also welcome. See you next time! 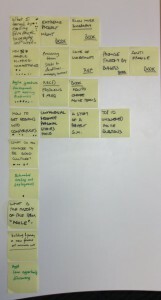 Next Next post: How do you plan for innovation time?